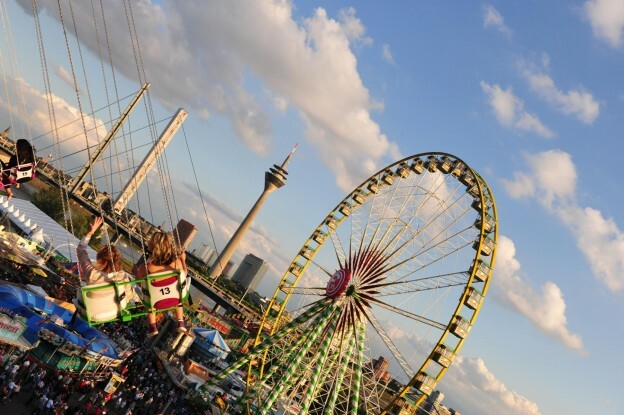 Düsseldorf’s Biggest Fun Fair on the Rhine is one of the biggest outdoor celebrations in Germany and beyond — a spectacular 10-day event with nearly 4 million visitors annually that rivals some of the world’s better-known annual mega celebrations including Oktoberfest. Time to put the international spotlight on the “Biggest Fun Fair” (2014 dates: July 11-20) and visit Düsseldorf at the height of the warm season for some bona fide German fest family fun. The fair ties together tradition and modern entertainment in one of the most extensive and colourful outdoor festivals in the world: Visitors will find not only the German fest staples – beer tents with live music, costumed servers, and all imaginable German fest food delicacies from savoury to sweet: sausage, roast, pig knuckles to potatoes and sauerkraut to apple cake and ginger bread and much more – but also state-of-the-art rides, including some of the world’s biggest temporary rides for kids of all ages. 3,000 uniformed marksmen on horseback and foot, marching bands and other traditional teams make their way through Düsseldorf’s streets in what is one of Germany’s largest parades and kick-o! ff for the fair. The actual Fun Fair will take place for the 13th time this year in its current location: the vast Rhine meadows on the Rhine River right across the city’s centre and easily reachable by foot, ferries, and public transportation. The Fair is a huge hit with audiences from the surrounding Ruhr Region, one of Europe’s most densely populated areas with 53 connected cities and 18 million residents in a 40 mile radius – giving the event much local character at world-class proportions and making it one of the best-kept secrets on the international mega outdoor festival circuit. For more information about Düsseldorf’s “Biggest Fun Fair on the Rhine” and about the destination Düsseldorf, please visit www.visitDuesseldorf.de.